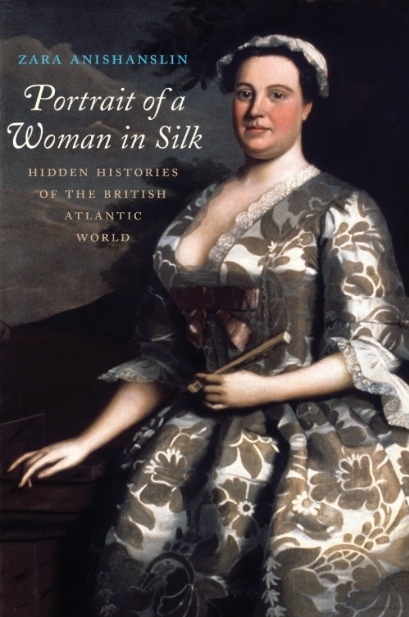 Portrait of a Woman in Silk: Hidden Histories of the British Atlantic World by Zara Anishanslin is a brilliant example of how one object and its careful analysis can lead to a nuanced and rich understanding of the past and its people. The 1746 portrait of Anne Shippen Willing (1710–91; Winterthur Museum) by Robert Feke (c. 1707–c. 1751) is the subject of this book, which bears witness to the lives of its painter and sitter, as well as the weaver and designer of the silk damask of Willing’s dress. The author weaves together their stories and provides us with an insightful analysis of the intellectual and economic codependence of the North American colonies and the larger British Empire. The book is divided into four sections. The first two explore the lives of the designer and weaver of the silk damask used to make the dress worn by Willing. Natalie Rothstein, former curator of textiles at the Victoria and Albert Museum, identified the designer, Anna Maria Garthwaite (1688–1763), and weaver, Simon Julins (1686/88–1788), through her work documenting the silk weaving industry of Spitalfields, London.1 Anishanslin’s study of Garthwaite and Julins goes far beyond what has been previously written about the two and is a significant contribution to the study of eighteenth-century textiles and the London weaving trade. In her research, Anishanslin encountered scant historical documentation of Garthwaite’s life, except for a cutwork landscape she made as a young girl; her textile designs, which survive in the collection of the Victoria and Albert Museum; and vital documents, specifically her will. The author took this limited information and wrote a fascinating section on Garthwaite, addressing her early history, her role as a textile designer within the larger London silk-weaving industry, and finally, her predilection for floral designs. This leads to a rich discussion of the importance of botany in the eighteenth century, the Enclosure Acts and their impact on country life, botanical publications contemporary with Garthwaite, and the Chelsea Physic Garden, where plants from throughout the world are collected and cultivated. She reveals how the British Empire was not only united through trade, but also through a shared culture that included a fashion for the study of botany, the collection of plants, and a predilection for textiles patterned with flowers. The silk weaver Simon Julins is the focus of the second section. Through her study of Julins and his life, which spanned almost a century, from about 1686/88 through 1778, Anishanslin highlights the importance of silk and sericulture within the global economy. Julins lived and worked in the Spitalfields neighborhood of London, and Anishanslin correctly points out that trade practices of the British Empire throughout the eighteenth century coalesced around the weavers of Spitalfields, who were especially prone to economic hardship due to competition from Continental European silks and Indian cotton. The London weavers often held violent protests against the importation of French silks as well as printed cottons from India. The protests of the early part of the century led to the Calico Acts, which affected both local and global trade networks. During the eighteenth century, the textile industry also evolved from a system in which master weavers employed a few apprentices and journeymen who often worked and lived together in the master’s home, to a proto-industrial model in which wealthy masters/manufacturers oversaw the work of hundreds of weavers. This shift in industrial practice led to dissatisfaction on the part of the weavers and to greater economic disparity between master/manufacturer and weavers. In this section, Anishanslin returns to the subject of botany, which connects the chapters focused on Julins to those of Garthwaite. The English passion for plants and flowers, as well as economic interests, encouraged the study of sericulture, which was fueled by the needs of English weavers for a more reliable, cheap source of silk fiber. This led to the goal of establishing sericulture in the British colonies, and although attempts were made to produce silk throughout the North American colonies, from Georgia to Massachusetts, they achieved limited success. The final two sections of the book examine the lives of the subject of the painting, Anne Shippen Willing, and its painter, Robert Feke. Both the Shippen and Willing families were leading citizens of Philadelphia; Willing’s husband, Charles, was a very successful merchant of textiles and later a participant in the triangular trade of cloth, sugar, and slaves. The painter of the portrait, Feke, moved within a circle of cultured elites throughout the colonies from Philadelphia to Boston and Newport. His story reveals the close cultural ties that bound together the British Empire. Anishanslin’s study of Anne Shippen Willing and her family’s role as a leader in Philadelphia’s social, political, and economic life leads to a discussion of the development of Philadelphia as a colonial marketplace. Anishanslin argues that Willing’s portrayal in the portrait, in which she is wearing a recognizable silk pattern and not a plain silk, as seen in most colonial portraits of the period, must be understood as an important device for advertising the family’s high economic status and her husband’s role as an importer and consumer of fine fabrics. That the portrait probably hung in the family home, whose first floor served as Charles’s business office, out of which he often sold the mercers’ goods he imported, underlines its role as symbolic of the family’s mercantile success. In her discussion of the family home, Anishanslin also mentions the quarters built behind it to house the family slaves. The role of slavery in the middle Atlantic and North American colonies is a subject that she comes back to in the final section, which is focused on Robert Feke. The discussion of Feke furthers the story of the North American colonies and their role within the greater British Empire, as well as the ways in which the lives of colonists differed from those who remained in England. Anishanslin begins by discussing Feke’s early life and his role as a craftsman/painter. She spends two chapters describing his life in Newport, Rhode Island, and Boston, where he was a part of a circle of cultured elites and painted portraits of many of the towns’ leading citizens. Particularly fascinating is her discussion of a pair of portraits depicting the Bostonians Mr. and Mrs. Charles Apthorp (1748; The Cleveland Museum of Art, and 1748; de Young Museum, Fine Arts Museums of San Francisco). In the latter portrait, Grizzell Eastwick (Mrs. Charles Apthorp) holds an open copy of John Milton’s Paradise Lost, which Anishanslin relates to the story of Adam and Eve, as Eve’s description as “the mother of mankind” made her a popular symbol of a fruitful and devoted wife. Charles Apthorp, the business partner of Thomas Hancock, was among the most successful merchants in Boston. The partners traded in many different commodities, including slaves, and Anishanslin examines Apthorp’s business practices both within and outside British law. She ends the chapter with a consideration of a portrait of Isaac Royall and his family (1741; Harvard Law School Library, Cambridge, MA). The Royalls moved from Antigua to Boston and brought several of their slaves with them. In 1754, the family had thirty-four slaves working for them at their estate in Medford, Massachusetts, a high number for New England households. She finishes the chapter with an important discussion of the practice and brutality of slavery in the North American colonies. Throughout Portrait of a Woman in Silk: Hidden Histories of the British Atlantic World, Anishanslin reveals how a material culture approach, exhaustive research, and a clear and insightful intellect can bring the past to life. Feke’s portrait of Anne Shippen Willing is a particularly rich source because sitter and painter are generally known. What sets Anishanslin’s work apart, however, is her interest in and research into the silk and pattern of the sitter’s dress. Throughout the text, the author skillfully elucidates each of her subject’s stories and, in the process, brings together their entwined narratives in order to tell the broader story of the British Atlantic world. Her research allows her to explore aspects of colonial culture in North America that are seldom written about, such as sericulture, the prevalence of slavery in colonial New England and Philadelphia, and the importance of Milton’s Paradise Lost as an indicator of British colonial gender roles. The book is well written and a pleasure to read. It is also well illustrated, although one wishes that the illustrations had been in color. In Anishanslin’s text, objects—in this case a portrait—provide a tangible link to the past, significantly enrich the topics under discussion, and help to bring the period to life in a way that words often fail to do. Inspired by an encounter with the textile designs of Anna Maria Garthwaite and discovery of their relationship to the portrait of Anne Shippen Willing, Anishanslin provides a deep study of the context of the creation of these objects and the people involved in such efforts. Cite this article: Pamela A. Parmal, review of Portrait of a Woman in Silk: Hidden Histories of the British Atlantic World, by Zara Anishanslin, Panorama: Journal of the Association of Historians of American Art 4, no. 1 (Spring 2018), https://doi.org/10.24926/24716839.1642. About the Author(s): Pamela A. Parmal is Chair of the David and Roberta Logie Department of Textile and Fashion Arts at the Museum of Fine Arts, Boston.